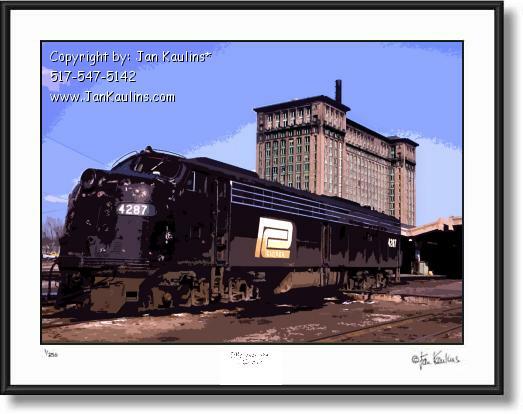 MICHIGAN CENTRAL STATION TRAIN DEPOT DETROIT photo art picture print for sale. This artistically enhanced DETROIT MICHIGAN CENTRAL TRAIN DEPOT photo art print for sale is made from an Original historic color Kodachrome slide showing this historic MICHIGAN CENTRAL TRAIN DEPOT with a Penn Central Train engine on the tracks at the back of this OLD DETROIT TRAIN STATION structure which was built in 1913 and at the time was the tallest and grandest train depot in the world. It officially closed in 1988 and remained abandoned and vandalized until Ford Motor Company recent purchased the property and will be renovating it for the Ford Motor Company. The extensive artistic work done on this image including removing mid-tones and texturing the remaining portions of the image gives this MICHIGAN CENTRAL DEPOT photo print a very unique silkscreen-like feel making it an extremely unique and original style work of photographic art. The powerful large diesel engine in the foreground highlights that fact that this was a train station. This is one of the most artistic treatments of an image in the entire Jan Kaulins collection.